Bands that change up their style on a regular basis have always had a special place on my heart. I really enjoy when you pick up the latest from your favorite group and it sounds nothing like their previous album. The four piece band I’m listening to today might be the personification of trying new things in the studio— and nearly 25 million albums sold to date, I must not be the only one who likes that approach. Four guys started a band back in 1992; they had a practice in February and their first gig was as an opener for a band that Keanu Reeves was the singer for. About a year after forming, Geffen Records came calling with a deal and a desire to get something out ASAP. That moment, Weezer was born and off to a good start. They threw together an album in less than a year, but the label didn’t want to do any real promotion for it—they wanted to see what sales could be generated by word-of-mouth alone. The Blue Album has sold nearly 7 million copies to date, so I’d say the strategy worked just fine. Twenty-four years later, the band is still going strong, and only had a couple members leave. They’ve essentially released an album each year, all of them selling well and reeling in a different demographic into being Weezer fans. Concerns were rampant when this album was released. Again there was little or no promotion and the lead singer, Rivers Cuomo, had put the band on hiatus to complete his education at Harvard and get married. Because of hectic schedules and again trying new things, the band recorded the album in three sessions in three different cities. They also used multiple producers to get varying sound styles. Despite all of the background drama, the album was a critical and commercial hit, debuting at the fourth spot in the Billboard 200. It’s fair to say I’ve been a big Weezer fan since ’94. Even someone like me had no clue this album was coming out until the week prior. No radio play singles were released in advance, and only a couple tracks leaked on iTunes a couple weeks before the drop. I recall picking it up on the first day like many others, not expecting greatness. Boy was I wrong. I was blown away by how my favorite little independent type punk/pop weird band had grown up. This is a well-produced, put together album that is almost like the original Blue Album, but only if those guys in 1994 knew how to make an album. The experimentation is outstanding, with the tracks where they took the most liberties being my favorite. One critic talked about how all the parts of this album don’t fit together, and it’s so much better because of it. 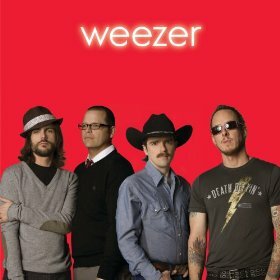 It gives it this new personality and gives you a side of Weezer never before seen. To get that kind of enjoyment for $5 bucks, we should all be so lucky – wait, we are! Pick this up today—you’ll enjoy it.